Using the same techniques that I used to have a look inside iMovie and Final Cut Pro, I’ve found that the recently released version of Blackmagic Design‘s colour grading application DaVinci Resolve 10 already handles the next version of Final Cut Pro X XML. Seeing as Final Cut Pro X will be able to export colour grading information in projects as XML, it makes sense that Resolve can read and write these settings. 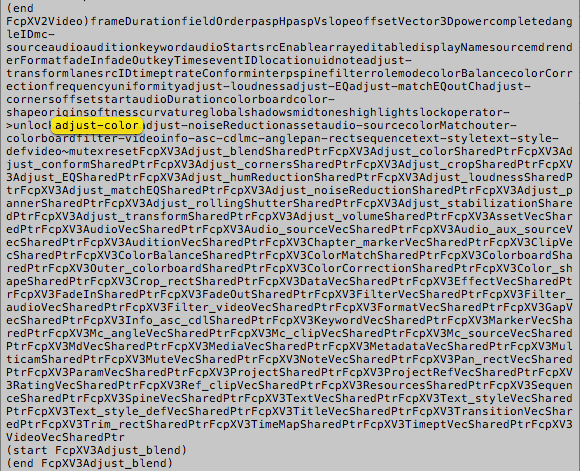 As well as references to Final Cut Pro X’ new colour correction XML elements, Resolve also refers to ‘adjust-stabilization,’ ‘adjust-rollingShutter’ values for video clips, ‘adjust-noiseReduction,’ ‘adjust-humReduction’ and ‘adjust-matchEQ’ for clips with audio and ‘text-style-,’ ‘ShadowBlurRadius’ and ‘baseline’ (but not ‘tab-stops’) for text.